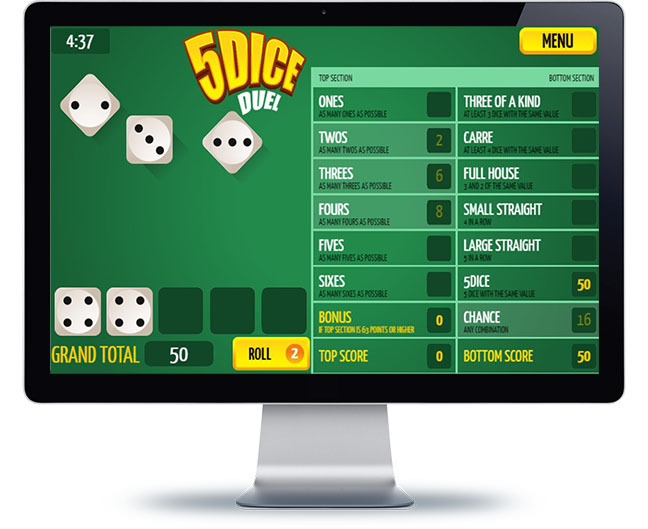 5Dice Duel is a Yahtzee game that will allow you to have fun and improve your analytical thinking skills at the same time. While some people believe in luck, you will need to have real skills in order to beat the highest score! Fill up the categories in the best way you can from dice combinations like “Full House,” a “Large Straight,” “Carré,” and the most popular and risky one, the 5Dice! You will need to make some dice combinations, throwing the dice three times in each turn and deciding which ones you would like to keep and which ones you would rather throw again. If you get 5 dices with the same value, you achieve the highest score: the 5Dice! The game only ends when all the combinations are crossed off in the score chart.